Quebec solidaire's Manon Masse speaks to supporters in Montreal, on Oct. 1, 2018. The upstart left-wing party Quebec solidaire parlayed its campaign momentum into election gains Monday, securing more than double the seats it held before the vote and making inroads other than in Montreal. Arguably the most left-wing party with seats in a Canadian legislature, Quebec solidaire won at least nine ridings, up from the three it held at dissolution. The strong performance even had the party battling with the once-mighty Parti Quebecois for third place in terms of seats. Its victories included its first-ever successes outside of Montreal, as well as a stunning upset of PQ Leader Jean-Francois Lisee. 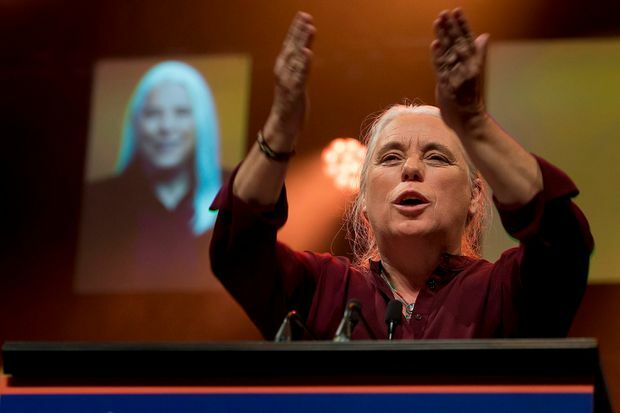 “I am so, so proud of us, so proud of the campaign we led,” Quebec solidaire co-spokesperson Manon Masse, told a cheering crowd of supporters after Quebecers had elected a majority Coalition Avenir Quebec government. The party appeared to strike a chord with voters between 18 and 34, and hoped increased visibility and rising poll numbers would pay off Monday night. Masse said Sunday any gains in seats would be considered a success in shaking up the status quo. Its campaign pledges included free education all the way from elementary school to doctoral studies, and a ban on the sale of all non-hybrid or gasoline-fuelled vehicles by 2030. Its platform promised to collect about $13-billion more a year to fill state coffers, mostly from wealthier Quebecers and large companies. Quebec solidaire also committed to a $15 hourly minimum wage and said it would invest $100-million per year over five years to help smaller businesses, farmers and community organizations adjust to the change. The party became a target in the campaign after it appeared to siphon support from the PQ, with Lisee taking aim at Masse during one of the debates. Lisee later accused Quebec solidaire of being a “Marxist” party that wants to nationalize all industries in the province. Vincent Marissal, the Quebec solidaire candidate who beat Lisee in the Montreal riding of Rosemont, described his victory as the triumph of hope over cynicism.